With more than three decades in the hotel marketplace, Grupo Posadas operates more than 104 hotels and 19,042 rooms in 50 beach and city destinations in Mexico, Brazil, Argentina and Chile. It's brands include AQUA, Fiesta Americana Grand, Fiesta Americana, Lat 19°, Caesar Park and Caesar Business, making Posadas the leading Mexican hotel operator in Latin America. 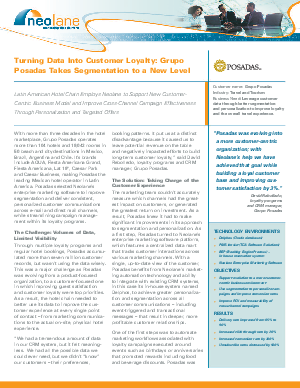 Posadas selected Neolane’s enterprise marketing software to improve segmentation and deliver consistent, personalized customer communications across e-mail and direct mail channels, while streamlining campaign management within its loyalty programs.